Briefly: She’s just standing there on the bus, this big red-haired girl in the weird clothes, waiting for someone to let her sit. Hoping against hope that she doesn’t sit next to him, Park refuses to look at her. Next thing he knows, she has to sit. They spend a few days like this on the bus, an uncomfortable, angry silence, making sure that they don’t touch. Steve’s girlfriend, Tina, starts a campaign of torment. Eleanor can’t help it that she’s so noticeable. She’s the kind of girl who stands out no matter how invisible she tries to be. Especially at home, especially with him. As it happens with many “opposites attract” stories, this tale begins with a couple of teens who couldn’t be more different. There is a wall built between them that day on the bus; but as Park observes and Eleanor quietly lets down her defenses, they may just find something wonderful. How they get together is a study in patience, tenacity and sheer chutzpah. Because Eleanor lives with torment and sadness and Park feels like trying to hang on to Eleanor is like trying to hold air. Didja Like It? : I loved this book. The entire tale, the way it was told, alternating between Park and Eleanor was wonderful. They each saw the world so differently, and because both of them were people of few words (or unwilling to give up secrets), the journey from bus seat combatants to their touching relationship was incredibly vivid, real, horrifying, meaningful, painful, scary and wonderful all at once. In a word, it was authentic. I also thoroughly enjoyed the secondary characters. They were so solid, expressing everything from a scary fury to a beaten-down timidity to a bewildered sort of parental love. But when the good needed to come through, they did. And when the bad were supposed to be evil, they were. It just wasn’t necessarily when you expected. Anything Else to Mention? : The end, with Tina and the revelation about [something something] and the unknown bits and the yeah and that…I can’t wait to read Ms. Rowell’s next book in hopes that it is at least 60% of what I just read. ‘Cause then it’ll still be more significant than approximately 75% of the books I have ever read. Phew. To Read or Not To Read: Absolutely, unless having these characters live in your head long after the book is finished bothers you. Because they will take up space in your noggin and you will find that you are hugging yourself a little more often for a few days. And looking for tall, pale girls with huge amounts of red hair. Because you’ve got to. For Park. 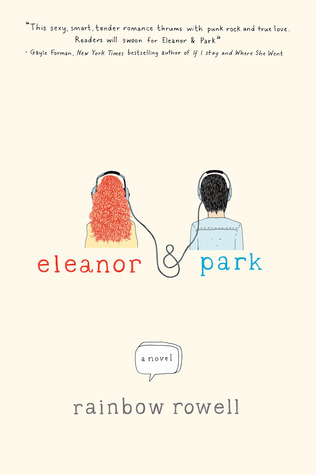 Eleanor & Park by Rainbow Rowell was published February 26, 2013 by St. Martin’s Press. Ink and Page picked this book up from the library, so no one had a choice about whether it was reviewed. You Might Want to Know: Some profanity, sexual discussions and underage drinking. I think I’m going to try this one despite the fact I had some issues with Fangirl. I’ve seen so many good things about it and my curiosity is killing me. Glad you enjoyed it so much! I know it’s the “It Girl” of books right now, and everybody is going on about it, but it ain’t no hype. Let me know what you think!